Water supply is an indispensable component of human life. Without it, comfortable living in the house is impossible. Water is used in household and household needs. 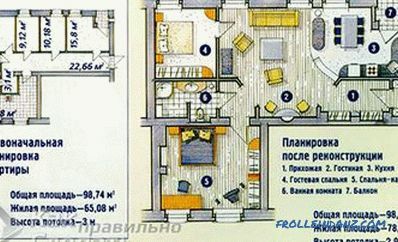 It is necessary for drinking and cooking, for heating systems and for the hygiene of the residents of the house. Any water supply system consists of a pipeline, communications inside the building, valves, various filters and mixers. This article is devoted to the choice of the most optimal option among the autonomous water supply systems. After reviewing the information, our reader will be able to find out that a well or a well is better. Personal water supply systems are considered in the article under various angles and criteria, which creates a holistic and complete picture of the main disadvantages and advantages of any of them. Individual water supply systems are more complex to install because they require organizing a direct water source. using a well (depth from 10-15 m. and more). The well has been used for centuries as a source of water, which is located on the near-permanent aquifer. Its shape is round, and the diameter is from 0.5 meters. Rectangular wells are rare. The well passes through the water layer and is sunk into a solid layer, which is 0.5–2 m below it. Manual devices or electric pumps are used to raise the water. Water gradually flows from various horizons and accumulating in a well stored there in certain quantities. If you pump out all the water from the well, then the new one will arrive only after a certain time. Wells can be sandy or artesian. A sand well may have a diameter of 3.6–5 cm or more. It is less deep than the artesian one and its filter is installed in a sandy aquifer. At the same time, the depth of the well, can reach 20-50 meters. The diameter of the artesian well is from 12 cm, and the depth is 50-100 meters and more. When using a well, the pump constantly takes water from the wellbore, and the new water, passing through the filter, under pressure, continuously, re-enters the wellbore. The system works in such a way that the intake of water always compensates for the influx of new. Therefore, the water from the well never ends, compared with the well. Now that you know the fundamental differences between a well and a well, we will compare these two sources of water supply in order to understand in which case a particular source will be better. The well should be located at a distance of at least 30 meters from the sources of dirt (manure heaps, toilets, pits, baths). 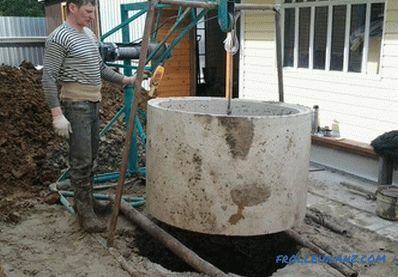 In the case of installation of the well - the distance can be reduced to 15 meters. Not recommended is the construction of a well on the slope of a ravine or the river bank, because in this case the main source will be dirty groundwater. Whatever the system of extraction of water would be chosen, it is necessary to ensure the passage and placement of equipment and machinery of the contractor, as well as the availability of space for materials on the site. 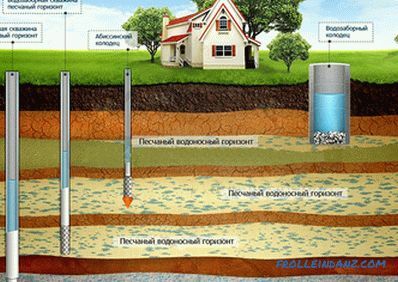 In the case of wells, more territory is needed for the disposal of excavated soil. 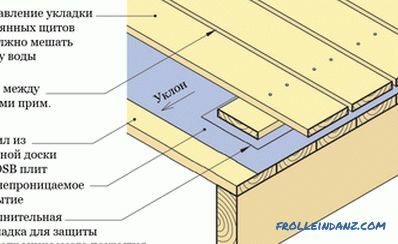 If a house has not yet been built, you can cut a well directly in the building area. This will significantly reduce the costs of pipelines and the caisson, but may be a problem during the repair of the well. Choosing a site for a well can cause more difficulties than choosing a location for a well. When constructing a well, a larger area will be involved than when drilling a well. Especially if one considers the fact that drilling can be carried out by mobile drilling rigs, which do not require a large area of ​​work. The result of man-made pollution was the ingress of untreated groundwater into sources at relatively shallow depths. A feature of deeper aquifers is the additional protection of water, clay layers. However, in this case there may be impurities of iron and salt in the water content. Wells, as water intake structures, are designed to collect water from the upper aquifer. And the wells are designed for abstraction of water from the underlying horizons, thereby providing better quality and more water. The purity of the water depends on the aquifer in which the well was dug or a well was drilled. In terms of water quality, it is difficult to say that a well or a well is better, because there is absolutely no clear water both in the wells and in the wells. 2. Due to the greater depth, the water quality is better in the wells, but iron, manganese and hydrogen sulfide may be present. If we consider the productivity of wells and wells, we can determine the following. Good well flow rates range from 3 to 5 m³ per day. That is, in 24 hours you can pump out from a well from 3,000 to 5,000 liters. But, in many cases, indicators of the maximum amount of fresh water in the wells, can be from 1 to 2 m³ per day. In such cases, people are faced with a lack of water, they have to save, resort to the use of hydraulic accumulators, tanks for collecting rainwater, drip irrigation systems. from 5 to 6 m³ / hour at a depth of 50 to 100 meters. This means that a well per hour can produce as much water as a well per day. However, it should be remembered that high costs require more powerful sewage. For an approximate calculation of the amount of water needed at a particular facility, you should add up all the expenditure data. According to SNiP, the amount of water consumed by a person per day is 200 liters. Therefore, this number must be multiplied by the number of residents with a small margin, designed for guests or for the case of the appearance of small children. * These data are valid when using modern technology and save water. It will take from 3 to 6 liters per day to water one cubic meter of land on a lawn or garden. Such a difference is caused by soil moisture, climatic conditions and the need for moisture of individual plants. In the technical costs, you must also include car washing and other domestic needs. Huge amounts of water are required with a pool. Thus, taking into account household and household needs, the total water consumption per day for a family of four can be from 2 to 4 m 3 and even more. If large water consumption is planned, then for the full water supply of the well there will be clearly not enough, in view of its small flow rate. The well is perfect as a backup emergency option or with a small water consumption. Thus, when determining whether a well or a well is better at a summer cottage or for a home, one should rely on the above factors. The main difference between the well and the well is the way they are arranged. The well is drilled with the help of specialized equipment. At the moment there are both large and mobile drilling rigs. 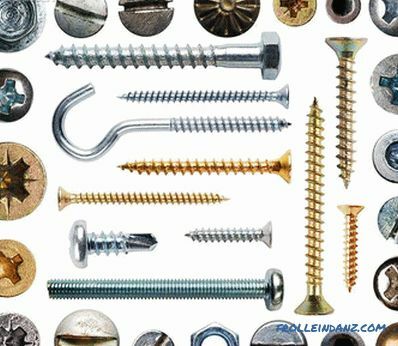 Therefore, if you do not have room for maneuvers, then it does not hurt to drill a well. Many work on drilling wells mechanized. To service a well, a technological pit is installed above its wellbore. 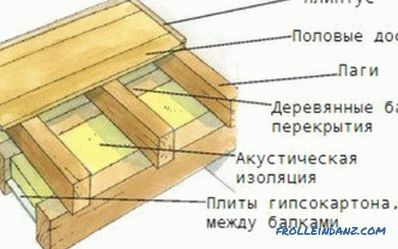 It can be built of brick or solid concrete, has a roof and a hatch. Often the pump itself is installed in the pit. The well is dug manually. For this purpose, special workers are hired, who dig a hole about two to three meters deep, after which they put two or three rings there. After that, the ground undermines themselves, so that they descend deeper. This happens until the workers reach the required depth. By the speed of the work being carried out, the leader takes the lead. In one day, workers can dig a maximum of three rings in the well. If the soil is sufficiently dense, their number may be reduced to two or even one. That is, a well of 10 meters will be dug for at least 5 days. A 10-meter well can be drilled in two hours. The operation of the well and the well is characterized by autonomy. Water from the well can be extracted manually (using a bucket and a special mechanism) or automatically (by setting the pump in the well and passing the communication pipes to the house). 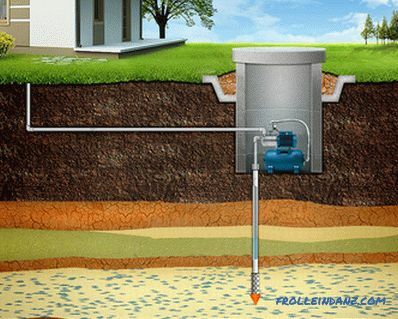 In the case of a well, it is necessary to purchase a special mechanical installation for manual water extraction. But as a rule, at present, the wells are equipped with electric pumps only. In the event of a power outage, it will not be possible to draw water from the well, but from the well it can be dialed at any time. The duration of the presence of water in a well or well depends on the aquifer from which the water is taken. Durability of sources is unforeseen. It is possible that a well will be dug in the neighboring area, once it has fallen into the same aquifer, reducing the amount of water in your well or well. Thus, on the basis of this criterion, it is difficult to determine whether a well or a well is better for a house. According to statistics, cases of well drying occur more frequently than cases when water runs out in wells. The latter are single. Most quickly, the well ceases to function due to silting or wear of its filter. Wells require maintenance much more often than wells. The price for construction of a well and a well is not the same. Digging a well is the least expensive option. The cost of work is determined by the depth of the mine, which can range from 3 to 40 meters. The price includes the work, delivery and installation of reinforced concrete rings. Additional costs will be spent on communications - a pump, pipes, etc. The price of well construction is determined by the geographical location of the site, the technical requirements for water supply and the diameter of the well pipe. If the depth of the aquifer is small (10–15 meters), then drilling a sand well of small diameter can be cheaper than a well. But more often, drilling a well is a more costly option. To equip the automatic system of water supply to the house, you must install water mains and a pump. This process is almost identical for the well and the well. The water mains consist of electric wire, pipe or corrugation, insulation, pipeline and heating cable. In the case of a well, the length of the line may be several times longer. The well pump is the central water supply in a country house. 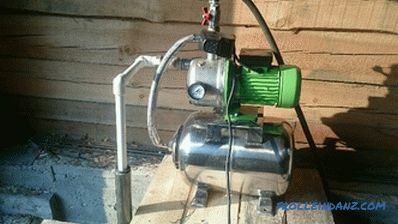 Rationally going to the choice of a pump for a well, you will provide it with many years of service and comfortable operation. Submersible or surface pumps are used to supply water. To choose the right type of pump, you need to know about the water level in the well and its seasonal changes. In some cases, installing a pump for a well and supplying communications is a more difficult task that is best entrusted to a specialist. Installing a pump in a well is a simpler task; even an amateur master can do it. Well should be constructed only when there are no aquifers on your site for the construction of a well or they are in very hard-to-reach places. The purchase of land in an unbuilt area should be taken very carefully and responsibly. There are sad cases when people bought a plot in a zone where clean water was at a depth of 100-150 m. Or was not found at all. 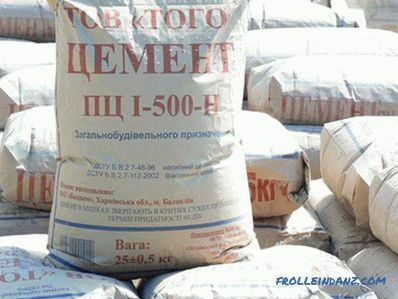 If you purchase such a site, you should ask the seller for the conclusion of geological studies, or get advice from drilling organizations that have information about the features of the soil. If residential areas are located next door, then the most reliable information can be obtained from their owners. were they satisfied with the selected water supply system? Thus, the installation of a well will be justified only when the extraction of water from the depth is impossible, due to the peculiarities of the land of a particular region. The well is able to collect water from various horizons, on which its pipes are lowered and to store it in certain quantities. This water will be of poor quality, but it will. Then you can clean it using various treatment plants. If the neighbors use wells in your region, then it is worthwhile to stop on this type of water supply. Drilling a well is a more reasonable and reliable version of the water supply system. 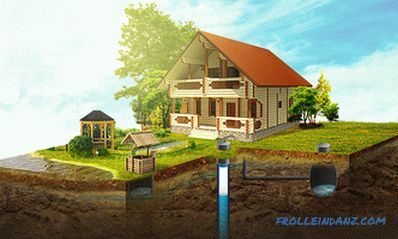 In addition to autonomous water supply systems, there is also a centralized system that is connected with the help of utilities after conducting relatively small earthworks, approving the possibility of providing the site and house with the required water pressure and connecting it to the nearest outdoor source. It should be remembered that it is possible to connect to the centralized water supply only if there is a sewage system, and water supply permission. If there is an opportunity to connect to the centralized water supply system, then it is best to choose this particular method. Most often this will be the best solution, even compared to the well.